The latest HD TVs announced by Korea's LG Electronics are notable on at least two fronts - all five of the 1080p sets have two high definition TV tuners that can show two HD channels at once and all benefit from some clever marketing. The Time Machine range of televisions includes LCDs of 37, 42 and 47 inches and plasma displays of 50 and 60 inches. Prices run from 2.5 million Won (£1,385) for the smallest LCD up to 8.9 million Won (£4,930) for the largest plasma, while each has a 160GB hard drive digital video recorder. As for those outstanding charm points, the dual high-definition tuners are capable of displaying two HD TV channels simultaneously, of course, but who in their right mind needs that anyway? The real benefit lies in being able to record one channel in full HD while watching another in all its glory. 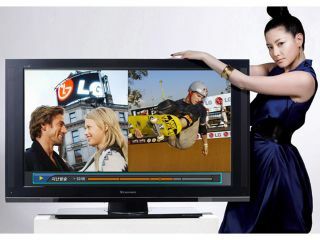 Current TVs generally force you to compromise and go for standard resolution in one of the channels. The smart marketing can be seen in the standard Korean practice of dubbing any hard-drive based video recorder a 'time machine', simply because it conveys more readily the nature of time shifting programmes and pausing live TV. After all, when was the last time you met anyone over 40 who gets the time shifting concept?